This unusual blanketing of textured knit frocks? Dreamworthy. 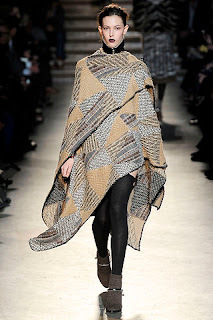 Missoni's RTW Fall '10 is a Fashion Week high point and an encouragement towards colder months. Cuts are elegantly askew, featuring juxtaposed pattern work, plush layers and the always impeccable Missoni craftsmanship.